The world’s population continues to age at an unprecedented rate: in 2016, 8.5% of people worldwide are aged 65 and over, which is projected to reach 17% by 2050 . Older adults, especially those who are frail, often have multiple interacting medical and social problems and are at greater risk for death and other adverse events . Frailty refers to a state of vulnerability and diminished physiological reserve that impedes the body’s ability to withstand and recover from minor challenges [2,3]. In the frail senior reserve and function are diminished across multiple physiological systems and the ability to cope with every day or acute stressors is compromised . This makes their health care complex and expensive, leading to disproportionate use of the health care resources . It is reported that many seniors with multiple co-morbid health issues spend the last 8-10 years of their life suffering from the impact of frailty on their health . Accurate and early assessment of frailty is crucial for effective care management and curbing of possible preventable health decline. Mounting evidence suggests frailty may be modifiable and can be prevented and sometimes even reversed . Emerging frailty guidelines recommend the early identification of frailty in “at risk” seniors to address modifiable variables and prevent deterioration before it occurs [6,7]. The recognition for frailty is important especially in the primary care setting [8-10]. A seemingly small medical event, for example; an infection, constipation, medication change, may trigger a dramatic change in the physical and mental wellbeing of an individual. As frailty increases the adverse consequences for the individual may be severe resulting in hospitalization, institutionalization or even death [8,9]. Primary care clinicians can take patients’ lifestyle and social context into consideration for early management. Even so, frailty prevention has not been a part of standard care of primary care, while valid and clinically useful tools for early identification of frailty are in demand . Frailty can be operationalized in many ways and several methods have been commonly used to assess frailty [11-12]. The Frailty Phenotype views frailty as a syndrome defined by five specific criteria; older adults who meet at least three of the criteria are “frail”, while those who show none of the five criteria are considered as “robust” . The Clinical Frailty Scale classifies frailty into nine categories ranging from very fit to terminally ill in determining frailty . The deficit accumulation based Frailty Index (FI) allows a more precise measurement of frailty and has gained increasing popularity [15,16]. The FI evaluates the extent to which deficits are accumulated with age in a given person, calculated as a proportional count of how many health problems an individual has (i.e. level of frailty increases proportionally as the number of health deficits increases [15,16]. The underlying mechanisms of deficit accumulation suggest that there is a critical threshold of agerelated decline in multiple physiological systems, beyond which deficits start to accumulate, resulting in poor health [3,17]. The FI has been validated by researchers around the world with multiple studies, applied to population-based and clinical settings alike with diverse outcomes [18-24]. The FI can be calculated using items from the standard Comprehensive Geriatric Assessment (CGA) [25,26]. The CGA is a systematic multidimensional information gathering approach for the assessment of older adults [27-32]. It includes redundant assessment items of multiple domains of cognition, emotion, motivation, health attitude, communication, sleep, pain, control of life, strength, balance, mobility, activities and instrumental activities of daily living, social engagement, and medication intake. Based on the comprehensive understanding of the overall health status of the older patients, health care professionals can develop a bird’s eye view of complex patients and generate a problem list and appropriate care plans [27-32]. The FI-CGA was initiated by both using data from a standardized CGA and data derived from the clinical examination of a population-based study [25,26]. The FI-CGA correlated highly with an empirical FI and was associated with higher risk of death and institutionalization. The FI-CGA has also been used to study older patients in acute care settings in relation to the risk of death, length of stay and discharge destination . A FI-CGA using a CGA-based questionnaire that can be completed by care partners has also been assessed as valid . More recently, the FI-CGA has been used to assess frailty in older people in China and in hospitalized patients in geriatric wards [35,36]. With the current situation for seniors and health care costs being unsustainable a preventative approach to frailty management is needed to face the challenges. In 2016 the Fraser Health Authority in Canada addressed the need to develop a frailty prevention/management approach by piloting a novel project aimed at reducing the impact of frailty on ‘at risk’ seniors. The project is called the Community Action and Resources Empowering Seniors (CARES; Figure 1), which is based on research evidence that frailty can be delayed and potentially prevented outright [5,39]. The CARES program is a four step evidence-based initiative that decreases the impact of frailty on health resources while promoting healthy aging [37,38]. It partners primary care physicians, early frail seniors health coaches to prevent frailty and support healthy aging for seniors “at risk” for frailty. Figure 1: The CARES Model demonstrating the four steps combining an electronic Comprehensive Geriatric Assessment (CGA) and health coaching to prevent frailty in primary care. As depicted in Figure 1, the first step of the CARES model has the primary care providers identify seniors 65-85 years of age living at home or in an assisted living setting with a Clinical Frailty Score between 3 and 6 (managing well; vulnerable; mildly frail; moderately frail), who are vulnerable to decline into frailty . The second step of the CARES model has the primary care team completes an electronic comprehensive geriatric health assessment capable of generating a Frailty Index at point of service to assess the seniors’ frailty level (Figure 2). 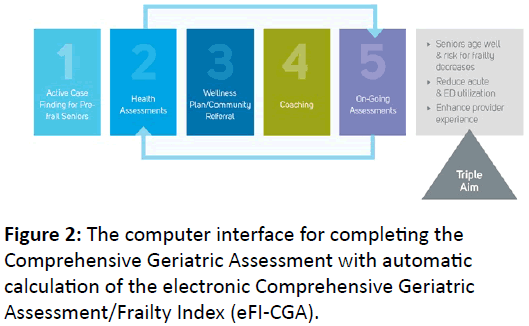 Figure 2: The computer interface for completing the Comprehensive Geriatric Assessment with automatic calculation of the electronic Comprehensive Geriatric Assessment/Frailty Index (eFI-CGA). The third step uses the Frailty Index (FI) to inform the creation of a senior’s individualized care plan. The intention of the plan is to identify goals most important to the senior participants that enhance their health and quality of life. The fourth step involves collaborators in the community who provide support to the senior to adhere to their care plan. In the CARES model these are health coaches, provided free to seniors through Self- Management BC. A telephone based health coach is paired with the senior to track the participants’ progress for up to six months as the patient works to adopt health protective behaviors which support development in exercise, nutrition and social engagement. Health coaching provides support to develop the senior’s self-management capacity while providing education and facilitating connections to resources in the community. At the end of six months, the electronic FI-CGA health assessment is repeated and compared to baseline to monitor the senior’s progression toward or away from frailty. The initial results of the CARES proof of concept pilot evaluation suggest it may be possible to slow the progression of frailty. In the preliminary study, there was a statistically significant decrease in the FI-CGA score of participating seniors (Figure 3). On average, the senior’s frailty index score - from the baseline CGA to the 6-month post CGA - decreased by 0.032 [37,38]. These pilot data inspired Fraser Health to spread their CARES model proof of concept into other communities. Evidence demonstrates that early identification of ‘at risk’, seniors followed by comprehensive community geriatric health assessments and health coaching is associated with better health outcomes for this cohort of early frail seniors. 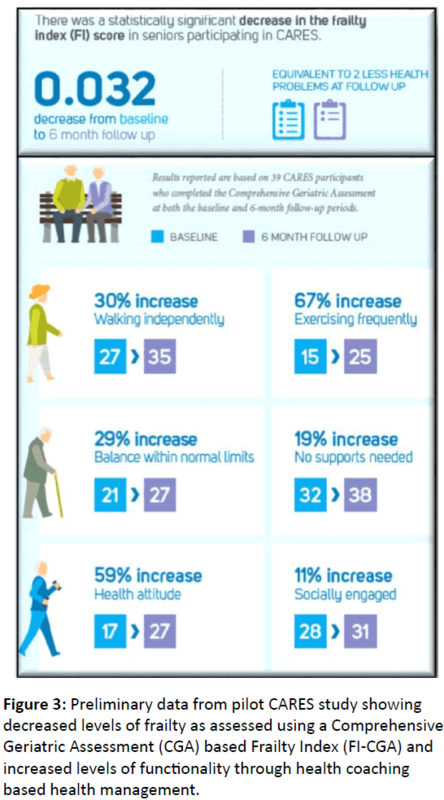 Figure 3: Preliminary data from pilot CARES study showing decreased levels of frailty as assessed using a Comprehensive Geriatric Assessment (CGA) based Frailty Index (FI-CGA) and increased levels of functionality through health coaching based health management. Working with the Divisions of Family Practice, Self- Management BC and local primary care clinics CARES has launched its approach into other communities for further study and evaluation. To support adoption into the primary care setting CARES assists with physician/ nurse practitioner frailty education and installment of the electronic format of the FI-CGA into the electronic medical records (Figure 2). With the electronic FI-CGA embedded into EMRs, physicians and Nurse Practitioners are now able to generate a frailty index at the point of service. CARES supports primary care teams with the FI-CGA education and adoption as well as facilitates patients’ access to free health coaching in the community to address the selfmanagement capacity of their chronic health risks and conditions. The electronic FI-CGA is now available to any Physician or Nurse Practitioner in primary care in BC who has access to the Intrahealth Profile electronic medical record. The collaborative CARES model is available to any community of primary care providers who have access to Intrahealth Profile and are interested in pursuing the full model. Ongoing research in collaboration with the world’s leading experts on aging and frailty is to establish its reliability and validity for widespread use, and to extend its use beyond primary care and family medicine to other healthcare settings. In the CARES model initial primary care education is focused on frailty and on the value of early frailty identification using electronic FI-CGA as the evidenced based assessment tool. Comprehensive Geriatric Assessment (CGA) is a well-established clinical tool used to determine older adults’ medical, psychosocial and functional capabilities [27-30]. It provides key baseline data for identifying degrees of risk and establishing individual care plans [31-32]. Proven benefits for patients include the preservation of physical function, maintenance of community living status and shorter stays and fewer admissions to hospitalization [27-32]. A deficit accumulation based frailty index can be calculated using CGA items. Using the eCGA to automatically determine electronic FI-CGA scores, healthcare practitioners are able to conveniently examine changes (including improvement) in the FI and encourage patients to develop self-care plans. As the key to care planning, the electronic FI-CGA precisely measures the level of frailty, providing evidence based cost-effective solution for large-scale application . Consistent with recommendations from frailty experts the electronic FI-CGA result is used by the primary care provider to draft an individualized care plan for the senior based on what is most important to them. With care plan in hand seniors contact their health coaches by phone to begin regular health coaching to improve their compliance to a self-created plan that includes exercise, nutrition and social engagement. The Self-Management BC free telephone based health coaching model is a creation of the University of Victoria Institute on Aging and Lifelong Health. Because it is phone based coaching is available to any participant who has a phone despite their location. Taken together, by using an evidenced based tool like the electronic FI-CGA in primary care setting CARES aims to help healthcare providers make more meaningful and comprehensive healthcare decisions. These informed decisions improve patients’ clinical outcomes and self-management competence leading to improving quality of life and reducing down the road costly hospital admissions and prolonged stays [41,42]. These do so precisely because they target frailty development before it becomes a serious issue for the patient. By creating individualized health care plans and referral to health coaching CARES aims to support self-management capacity in “at risk” patients and support their health by engaging them in demonstrated health protective behaviors. Implementing the electronic FI-CGA into the electronic medical records of primary care supports the use of a reliable and valid measurement of frailty at point of service. Using the electronic FI-CGA in the clinic setting guides healthcare providers to make more meaningful and comprehensive healthcare decisions, which in turn improve patients’ clinical outcomes. Post FI-CGA health coaching aims to both support the senior’s competence in their self-management as well the adoption of health promoting behaviors like exercise, improved nutritional choices while helping the senior to navigate their community resources. The CARES collaborative model in primary care demonstrates healthcare cost savings over time by addressing frailty at an early stage, avoiding costly hospital admissions. It further promises improving the quality of life of seniors by generating a sense of empowerment and control over their risk for frailty through exercise, nutrition and social engagement making their final years of life with chronic conditions more tolerable and enjoyable. Ultimately it is anticipated CARES will be part of a larger strategy that provides real alternatives for patients at risk for frailty and support them to age well and enjoy the benefits of a healthier life lived out in their communities. The authors sincerely acknowledge Drs. K. Rockwood, O. Theo, P. McGowan and B. Clarke for critical discussions and collaborations in developing the pilot study of the CARES program and Ms. B Selema for assistant with manuscript format. Fraser Health Authority Operating Funding; Canadian Foundation for Health Care Improvement; Surrey Hospital & Outpatient Centre Foundation. The authors have no conflict of interest with this work. He W, Goodkind D, Kowal P (2016) US Census Bureau-2016: International population reports. An Aging World: P95/16-1. US Government Publishing Office, Washington, DC. Clegg A, Young J, Iliffe S, Rikkert MO, Rockwood K (2013) Frailty in elderly people. Lancet 381: 752-762. Mitnitski A, Song X, Rockwood K (2013) Assessing biological aging: the origin of deficit accumulation. Biogerontology 14: 709-717. Morley JE, Vellas B, van Kan GA, Anker SD, BauerJM, et al. (2013) Frailty consensus: A call to action. J Am Med Dir Assoc 14: 392-397. Wang C, Song X, Mitnitski A, Fang X, Tang Z, et al. (2014) Effect of health protective factors on health deficit accumulation and mortality risk in older adults in the Beijing Longitudinal Study of Aging. J Am Geriatr Soc 62: 821-828. Turner G, Clegg A (2014) British Geriatrics Society; Age UK; Royal College of General Practioners-2014. Best practice guidelines for the management of frailty: a British Geriatrics Society, Age UK and Royal College of General Practitioners report. Age Ageing 43: 744-747. Stijnen MMN, Jansen MWJ, Vrihjoef HJM, Duimel-Peeters IGP (2013) Development of a home visitation program for the early detection of health problems in potentially frail community-dwelling older people by general practices. 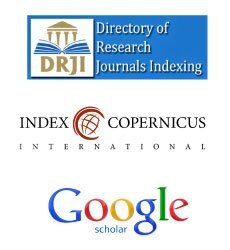 European Journal of Ageing 10: 49-60. Lacas A, Rockwood K (2012) Frailty in primary care: a review of its conceptualization and implications for practice. BMC Med 10:4. Romero-Ortuno R (2015) Frailty in Primary Care. Interdiscip Top Gerontol Geriatr 41: 85-94. Lee L, Patel T, Hillier LM, Maulkhan N, Slonim K, et al. 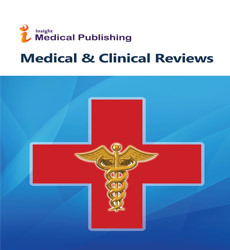 (2017) Identifying frailty in primary care: A systematic review. Geriatr Gerontol Int. Theou O, Brothers TD, Mitnitski A, Rockwood K (2013) Operationalization of frailty using eight commonly used scales and comparison of their ability to predict all-cause mortality. J Am Geriatr Soc 61: 1537-1551. Armstrong JJ, Stolee P, Hirdes JP, Poss JW (2010) Examining three frailty conceptualizations in their ability to predict negative outcomes for home-care clients. Age Ageing 39: 755-758. Fried LP, Tangen CM, Walston J, Newman AB, Hirsch C, et al. (2001) Cardiovascular Health Study Collaborative Research Group. Frailty in older adults: evidence for a phenotype. J Gerontol A Biol Sci Med Sci 56: 146-156. Rockwood K, Song X, MacKnight C, Bergman H, Hogan DB, et al. (2005) A global clinical measure of fitness and frailty in elderly people. CMAJ 173: 489-495. Mitnitski A, Rockwood K (2015) Aging as a process of deficit accumulation: its utility and origin. Interdiscip Top Gerontol 40: 85-98. Bennett S, Song X, Mitnitski A, Rockwood K (2013) A limit to frailty in very old, community-dwelling people: a secondary analysis of the Chinese longitudinal health and longevity study. Age Ageing 42: 372-377. Song X, Mitnitski A, Rockwood K (2010) Prevalence and 10-year outcomes of frailty in older adults in relation to deficit accumulation. J Am Geriatr Soc 58: 681-687. Zeng A, Song X, Dong J (2015) Mortality in Relation to Frailty in Patients Admitted to a Specialized Geriatric Intensive Care Unit. J Gerontol A Biol Sci Med Sci 70: 1586-1594. Hubbard RE, Peel NM, Samanta M, Gray LC, Mitnitski A, et al. (2017) Frailty status at admission to hospital predicts multiple adverse outcomes. Age Ageing 22: 1-6. Goldstein J, Hubbard RE, Moorhouse P, Andrew MK, Mitnitski A, et al. (2015) The validation of a care partner-derived frailty index based upon comprehensive geriatric assessment (CP-FI-CGA) in emergency medical services and geriatric ambulatory care. Age Ageing 44: 327-330. Bruyere O, Buckinx F, Beaudart C, Reginster JY, Bauer J, et al. (2017) How clinical practitioners assess frailty in their daily practice: an international survey. Aging Clin Exp Res. Song X, Mitnitski A, Rockwood K (2011). Nontraditional risk factors combine to predict Alzheimer disease and dementia. Neurology 77: 227-234. Song X, Mitnitski A, Rockwood K (2014) Age-related deficit accumulation and the risk of late-life dementia. Alzheimers Res Ther 6: 54. Jones DM, Song X, Rockwood K (2004) Operationalizing a frailty index from a standardized comprehensive geriatric assessment. J Am Geriatr Soc 52: 1929-1933. Jones D, Song X, Mitnitski A, Rockwood K (2005) Evaluation of a frailty index based on a comprehensive geriatric assessment in a population based study of elderly Canadians. Aging Clin Exp Res 17: 465-471. Stuck AE, Siu A, Wieland G, Adams J, Rubenstein LZ (1993) Comprehensive geriatric assessment: A meta-analysis of controlled trials. Lancet 342: 1032-1036. Stuck AE, Iliffe S (2011) Comprehensive geriatric assessment for older adults. BMJ 27: 343d6799. Stuck AE, Aronow HU, Steiner A, Alessi CA, Bula CJ, et al. (1995) Trial of annual in-home comprehensive geriatric assessments for elderly people living in the community. N Engl J Med 33: 1184-1189. Wong RY (1999) Routine use of comprehensive geriatric assessment needed in outpatient practice. Geriatric Aging 2: 10-22. Ekdahl AW, Alwin J, Eckerblad J, Husberg M, Jaarsma T, et al. (2016) Long-term evaluation of the ambulatory geriatric assessment: A frailty intervention trial (AGe-FIT): Clinical outcomes and total costs after 36 months. J Am Med Dir Assoc 17: 263-268. TIkkanen P, Lonnroos E, Sipila S, Nykanen I, Sulkava R, et al. (2015) Effects of comprehensive geriatric assessment-based individually targeted interventions on mobility of pre-frail and frail community-dwelling older people. Geriatr Gerontol Int 15: 80-88. Evans SJ, Sayers M, Mitnitski A, Rockwood K (2014) The risk of adverse outcomes in hospitalized older patients in relation to a frailty index based on a comprehensive geriatric assessment. Age Ageing 43: 127-132. Goldstein J, Hubbard RE, Moorhouse P, Andrew MK, Mitnitski A, et al. (2015) The validation of a care partner-derived frailty index based upon comprehensive geriatric assessment (CP-FI-CGA) in emergency medical services and geriatric ambulatory care. Age Ageing 44: 327-30. Xi H, Shi J, Meng L, Zhou G, Zhou BY, et al. (2016) Application of frailty index for comprehensive geriatric assessment in the elderly in China. Zhonghua Liu Xing Bing Xue Za Zhi 37: 718-721. Ritt M, Radi KH, Schwarz C, Bollheimer LC, Sieber CC, et al. (2016) A comparison of Frailty Indexes Based on a Comprehensive Geriatric Assessment for the Prediction of Adverse Outcomes. J Nutr Health Aging 20: 760-767. Theou O, Garm A, Park GH, Song X, Clark B, et al. (2017) Reversing frailty levels in primary care using the CARES model. J Can Geriatr Soc 20: 3. Garm A, Park GH, Song X (2017) Frailty prevention in “at risk” older adults in the primary care and community setting. The 21st IAGG World Congress of Gerontology and Geriatrics. Late Breaker Abstract 2702061. Puts MTE, Toubasi S, Atkinson E (2016) Interventions to prevent or reduce the level of frailty in community-dwelling older adults: a protocol for a scoping review of the literature and international policies. BMJ Open 6: e010959. Clegg A, Bates C, Young J (2017) Development and validation of an electronic frailty index using routine primary care electronic health record data. Age Ageing. Lisiak M, Uchmanowicz I, Wontor R (2016) Frailty and quality of life in elderly patients with acute coronary syndrome. Clin Interv Aging 11: 553-562. Kojima G, Iliffe S, Morris RW, Taniguchi Y, Kendrick D, et al. (2016) Frailty predicts trajectories of quality of life over time among British community-dwelling older people. Qual Life Res 25: 1743-1750.